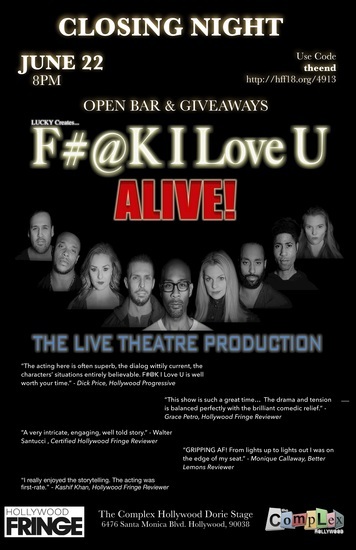 Hollywood Fringe - f#@k i love u: alive! Douglas Winston, a black conservative councilman in Los Angeles has built his supposed dream life and family with his college sweetheart Angie, a white liberal philanthropist, and their twin boys. Douglas’ birth parents died in a fire and he was adopted by his Godparents, a white upper-middle-class couple. They had a son of their own just months younger, James “J” Winston. J now in his early 30’s is an out-of-work actor who rebels against authority and treats life recklessly. Douglas and J are experiencing the loss of their publicly loved Grandmother in very different ways. J is feeling the loss of someone who loved him. Douglas is coming to grips with the verbal and physical abuse she inflicted on him. Douglas’ work life is complicated with a personal assistant, Clare, having a psychotic romantic agenda for him. Also, Douglas’ CPA Russell, exhausted by passed failed relationships with women, follows an impulse making a move on someone new and completely different. J’s friend with benefits Tiffany is on her personal journey to change her partying and self-destructive ways when her boss, Timothy, uses his power and charms to ignite a situation that’s seen completely differently by each of them. F#@K I Love U is a dramatic tale of a modern family that is quickly pulled into a spiral of interconnected events that test the limits of their bond and mutual love. These powerful stories with compelling characters are intertwined to make unprecedented and sensational entertainment. Every thought provoking episode ends in suspense, leaving you wanting more, all the way to the explosive conclusion.